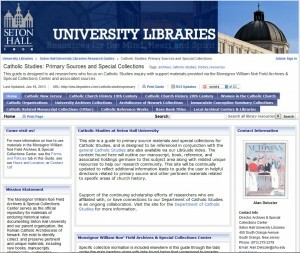 In collaboration with the Department of Catholic Studies and University Libraries, Catholic Studies: Primary Sources and Special Collections, featuring archival resources housed in the Monsignor William Noé Field Archives & Special Collections Center, has been created to inform the community about our unique primary source offerings that focus upon Catholicism in its varied forms. Like other LibGuides that are designed to help individuals navigate their way through a particular subject area, this guide provides students, faculty, and others with research leads through a series of abstracts, site links, and relevant information boxes. The major feature of this particular LibGuide is providing detailed lists of finding aids created by Professor Tracy M. Jackson (who also co-edits this site), grouped by subject, that describe unique manuscript collections housed within our Center. Those related to the Catholic Church can be found under designated heading tabs including: Catholic New Jersey; Catholic Church History, 19th Century; Catholic Church History, 20th Century; Women in the Catholic Church; and Catholic Organizations. Collections belonging to the parent organizations of the Center are listed under University Archives Collections and Archdiocese of Newark Collections. In addition to these, the personal and professional papers of various Catholic political legislators including former New Jersey Governors Richard Hughes and Brendan Byrne along with notable figures such as Bernard Shanley, Matthew Rinaldo, Marcus Daly and Leonard Dreyfus are also well represented. This guide also highlights collections and materials held outside of the Center. Special sections highlighting unique bibles found at the Immaculate Conception Seminary, rare book holding descriptions and traditional reference guides such as almanacs, directories, and encyclopedia citations held in Walsh Library are provided for context. 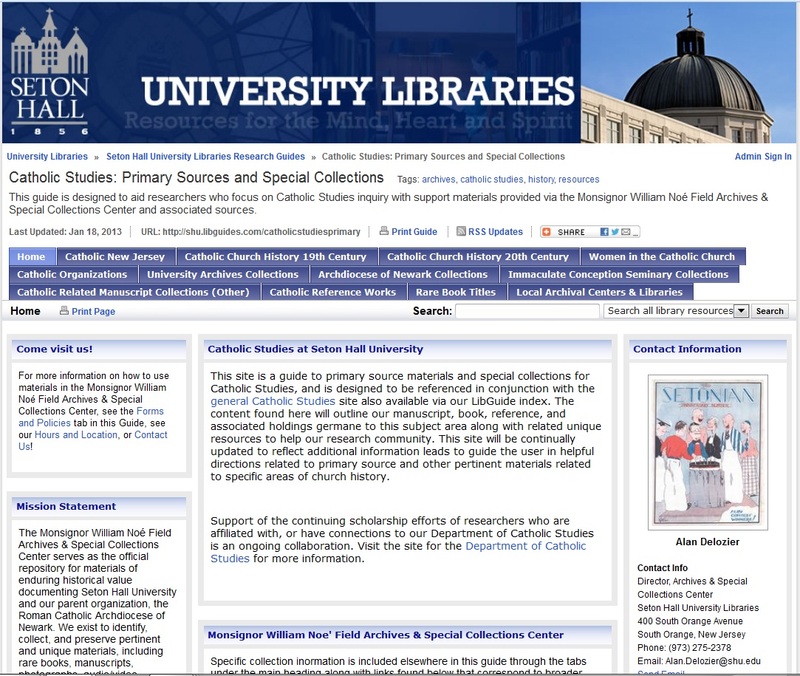 Information leads connecting to local research centers and libraries featuring other Catholic based resource materials can also be found via this site. A companion guide, Catholic Studies, produced by Professor Anthony E. Lee gives information about general research in Catholic Studies. Or visit our other LibGuides specifically related to Archives & Special Collections.